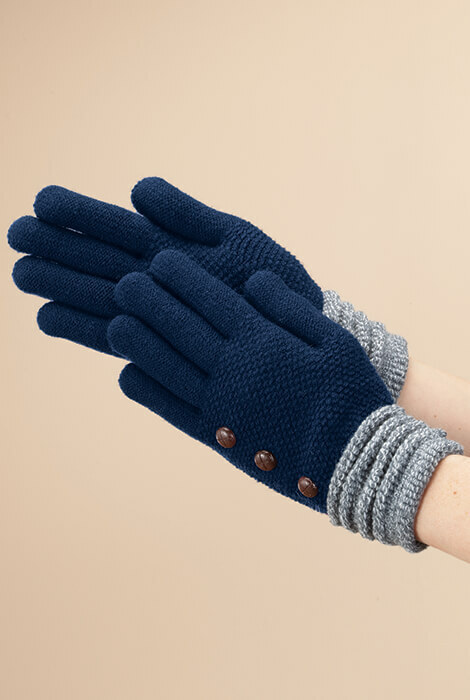 With cute wooden buttons and fun ribbed cuffs, Britts Knits™ gloves offer more to LOVE—keeping you stylish, while keeping hands toasty! 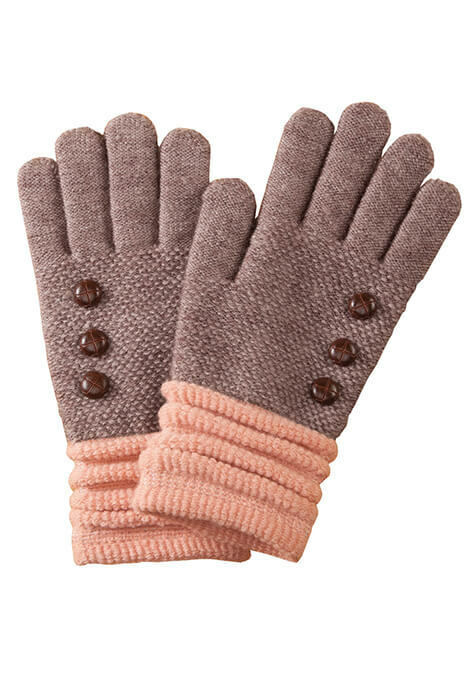 Slightly stretchy for easy on/off, the two-tone knit gloves are warm, soft and simply adorable. 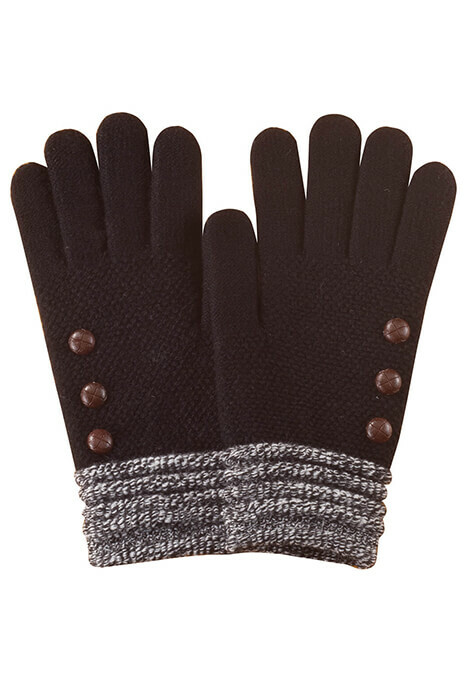 Knitted gloves made with 100% polyester; hand wash, dry flat. One size fits most. Imported. They were a great and comfortable fit. And very attractive & warm. I bought 2 pair because I'm always loosing something. I'd recommend them to my friends. The navy blue goes with all my jacket selections. I love the look of these gloves! 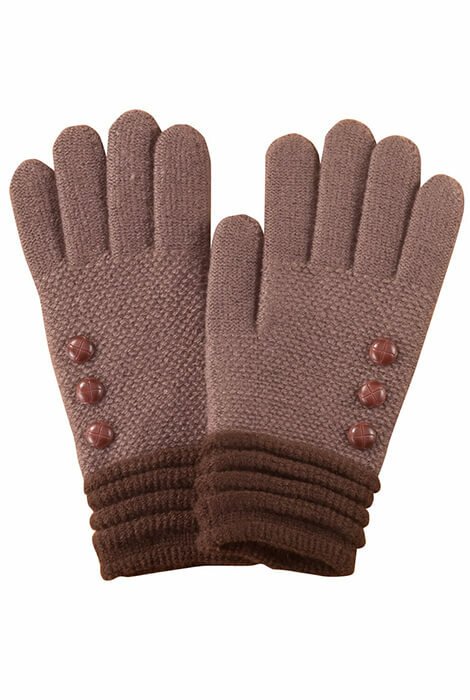 They are so soft on the inside and were great at keeping my hands warm. These are so cute. Just adds a bit of pizzazz to my wardrobe. 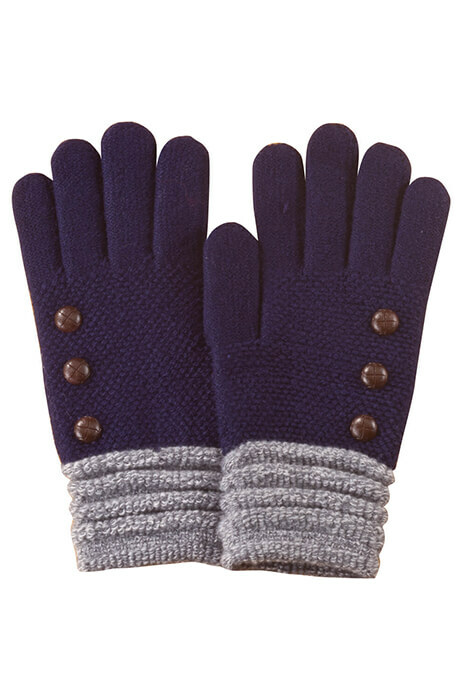 I wanted navy gloves to use when walking the dog, shopping, etc. I saw these and they looked decent for the price. They fit good and the length of the fingers is just right.....not so long like a lot of gloves. I noticed all the colors have brown buttons. I would rather have the buttons match the color but they are still cute. WARM GLOVES, I WORE THEM IN 28 DEGREE WEATTHER FOR OVER AN HOUR, AND MY HANDS STAYED NIICE AND TOASTY. I love these gloves, especially because they're long enough to cover my wrists so there isn't any skin exposed between my coat and the gloves. They're well-made and wash well. Thick and warm, and I love the color. I purchased the mauve with pink trim. I would buy another pair in a different color. I bought the blue. I would buy them again. Would recommend to others. Quality merchandise, low price and fast shipping. Britts Knits are a Hit! I find them very warm and actually, a couple of times I removed them because my hands felt to warm. I haven't tested them in cold vs very cold temperatures but, typically I pull out my gloves when it's 40 degrees or colder. These are nice for if you are going out to dinner in the cold. They are not useful for if you are going out to shovel snow for 20 or so minutes. My fingertips started to burn. I got the black with gray cuffs, and the red-brown, wooden buttons just don't look right. Either no buttons or black would have been better.